This weekend a friend came over and we hung out at my house. 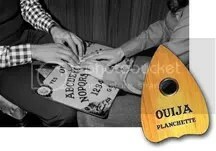 He asked if he could choose a game from my game closet, so I said “go for it.” He chose the Ouija board, which I haven’t played seriously since the mid -late 80’s when I used to play with my mom and grandmother. It was always a lot of fun and consistently accurate.